Change things up with these side-trips from Siena: Montalcino (Poggio Rubino & Podere Il Cocco), Ciacci Piccolomini d'Aragona (in Castelnuovo dell'Abate) and San Gimignano (Guardastelle Vineyard, Historic Centre of San Gimignano, & more). Dedicate the 2nd (Tue) to wine at some of the top wineries in the area. Next up on the itinerary: pause for some serene contemplation at Siena Cathedral, get lost in a book at Biblioteca Piccolomini, learn about winemaking at Fattoria di Montemaggio, and contemplate the long history of Centro Storico di Siena. For reviews, maps, other places to visit, and other tourist information, go to the Siena trip planner . Florence to Siena is an approximately 1-hour bus ride. You can also drive; or take a train. In October, daily temperatures in Siena can reach 26°C, while at night they dip to 15°C. Finish your sightseeing early on the 9th (Tue) to allow enough time to travel to Portoferraio. Portoferraio is a town and comune in the province of Livorno, on the edge of the eponymous harbour of the island of Elba. You'll find plenty of places to visit near Portoferraio: Spiaggia di Cavoli (in Marina di Campo), Campo nell'Elba (Spiaggia delle Tombe & Spiaggia di Fetovaia) and Monte Capanne (in Marciana). 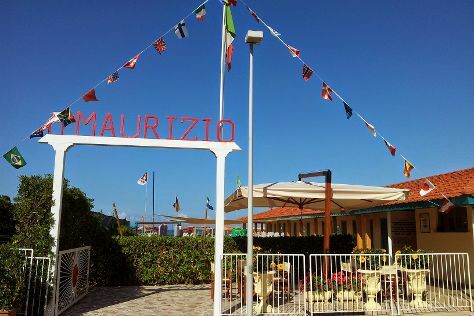 There's still lots to do: kick back and relax at Spiaggia di Seccione and stroll through Spiaggia di Acquarilli. To find where to stay, maps, photos, and other tourist information, you can read our Portoferraio trip itinerary builder site . Do a combination of car and ferry from Siena to Portoferraio in 3 hours. Alternatively, you can do a combination of bus, train, and ferry; or do a combination of train and ferry. Traveling from Siena in October, you will find days in Portoferraio are slightly colder (22°C), and nights are about the same (17°C). Cap off your sightseeing on the 17th (Wed) early enough to travel to Viareggio. Viareggio is a city and comune in northern Tuscany, Italy, on the coast of the Tyrrhenian Sea. Change things up with these side-trips from Viareggio: Lucca (St Martin Cathedral, Guinigi Tower, & more). There's much more to do: don't miss a visit to Torre di Pisa, kick back and relax at La Lecciona, tour the pleasant surroundings at Bagno Eva, and take advantage of the amenities at La Vela BeachClub. To find other places to visit, traveler tips, more things to do, and tourist information, go to the Viareggio trip itinerary planning website . Getting from Portoferraio to Viareggio by combination of ferry and car takes about 2.5 hours. Other options: do a combination of ferry and train. In October, plan for daily highs up to 25°C, and evening lows to 14°C. You'll set off for Fiesole on the 24th (Wed). Fiesole is a town and comune of the Metropolitan City of Florence in the Italian region of Tuscany, on a scenic height above Florence, 8km northeast of that city. Get out of town with these interesting Fiesole side-trips: Florence (Museo Nazionale del Bargello, Uffizi Galleries, & more). The adventure continues: examine the collection at Galleria dell'Accademia, don't miss a visit to Piazzale Michelangelo, take in the spiritual surroundings of The Baptistery of St. John, and take an in-depth tour of Basilica di Santa Croce. To see reviews, where to stay, photos, and tourist information, go to the Fiesole trip maker site . Traveling by car from Viareggio to Fiesole takes 1.5 hours. Alternatively, you can take a train. In October, daytime highs in Fiesole are 25°C, while nighttime lows are 14°C. Finish your sightseeing early on the 31st (Wed) so you can take a train back home.